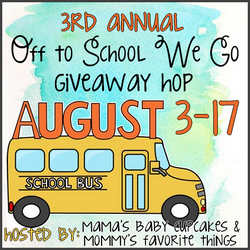 Welcome to the 3rd Annual “Off to School We Go!” Giveaway Hop hosted by Heather from Mommy’s Favorite Things and Michelle from Mama’s Baby Cupcakes. This hop is focused on items you’d want/need for your children to get ready for school! Each blog has a minimum prize package of $25 per winner and after visiting my giveaway, make sure you use the linky below to take a look at the other blogs to see what they have to offer for you! Back to school is quickly approaching and for parents that usually means lots of shopping. We are provided with a list of items from the teachers and then spend hours upon hours trying to get everything that we need. If our kids are a little older, usually they fuss and fight about which items are “cool” and which ones are not. Trust me, I have been on both ends of that before. Well, Debbie Lynn, Inc is making life a little bit easier on everyone. Not only do they have back to school items that are sure to fit your budget, they are great quality, and pretty cool looking if you ask me. They have a wide variety of designs so there is sure to be something that your child likes – and even will want to show off. I personally love the high heel shoe pencil sharpener and the “Really?” sticky note pad. Debbie Lynn, Inc. offers a wide variety of office supplies and back to school items including pens, markers, erasers, pushpins, and much more. Basically anything that you need for back to school, they have it. They are not only fun and trendy, but they are great quality as well. I cannot wait to send my girls back to school with all of these goodies – I know their friends will be jealous and begging their parents to shop for Debbie Lynn accessories! These can be found at Five Below so head out now and beat the back to school rush! Enter to win a package of Debbie Lynn, Inc. back to school accessories using the Gleam form below. Be sure to check out my other giveaways while you are here and GOOD LUCK! Doll House #Giveaway PLUS the Gifts Of Love Giveaway Hop! My grandsons go back to school this Thursday, August 6th! Wow! That seems so soon! My grandchildren head back to school Wed, Sept. 2nd :)out of 8 I have 5 heading off..
My nephews head back to school August 17th . That is way too early in my opinion. It seems like kids now have much shorter summer vacations. My grandchildren go back to school today, Aug. 10th. My daughter starts preschool on August 28.